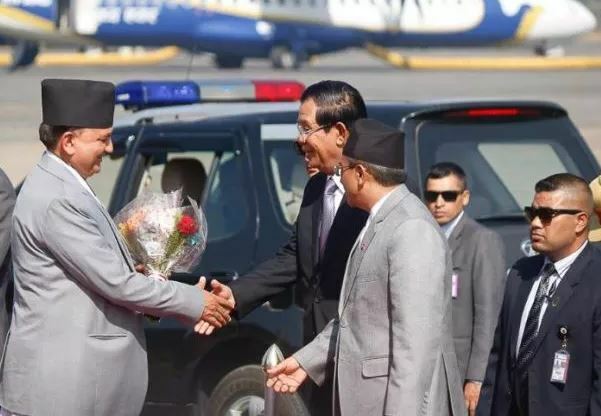 Nepal Foreign Affairs (KATHMANDU, 29 November 2018) – Prime Minister of Cambodia, Hun Sen has arrived Kathmandu today for the official visit of Nepal at the invitation of Prime Minister KP Sharma Oli. Similarly, State Counsellor of Myanmar, Aung San Suu Kyi, has also arrived Kathmandu. Both, Prime Minister Hun Sen and State Counsellor Suu Kyi, will attend four-day Asia Pacific Summit that will be inaugurated on Saturday. Deputy Prime Minister and Defence Minister Ishwor Pokhrel welcomed the Cambodian Prime Minister at the VVIP Lounge of Tribhuvan International Airport. On the occasion, a contingent of Nepal Army offered a guard of honour to Prime Minister Hun Sen.
Before Prime Minister Hun Sen lands in Kathmanu, State Counsellor of the Republic of the Union of Myanmar Daw Aung San Suu Kyi had arrived Kathmandu for official goodwill visit. She was also welcomed by Deputy Prime Minister and Defence Minister Pokhrel at the Airport.